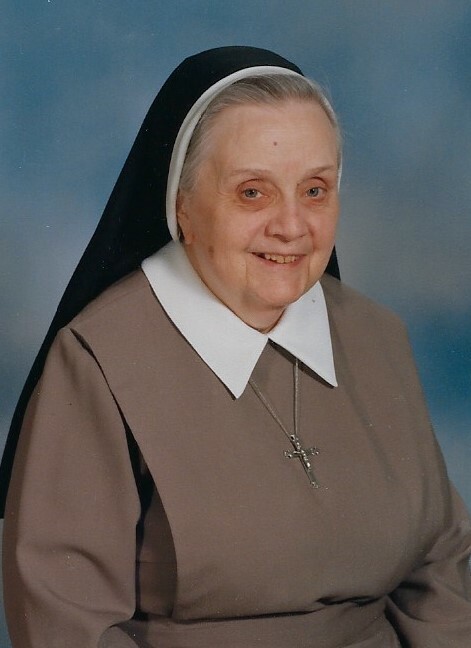 Sister Therese Martin, s.c.o, age 93, a member of the Sisters of Charity of Ottawa for 70 years, died at St. Joseph Residence in Lowell, on Tuesday, August 7, 2018, after a brief illness. Born in Haverhill, MA, on December 25, 1924, she was the daughter of the late Paul and Rose-Anna (Hevey) Martin. Sister Therese was educated in Haverhill. She taught at St. Joseph High School for girls from 1948-1956. She served as the secretary to the Provincial from 1956-1960. Then began a 42 year assignment as accountant for what is now known as D’Youville Life and Wellness Community. She retired at St. Joseph Residence in 2002. She is survived by one brother, Rev. Normand Martin, SM of Lawrence; her sister in law, Marie Jeanne (Duchemin) Martin, and several nieces and nephews. She was predeceased by her parents, her sisters Yvette Vallieres and Lillian Bentley and brothers Gerard and Ronald. MARTIN – Sister Therese Martin s.c.o. Friends may call at St. Joseph Residence, 977 Varnum Avenue on Thursday from 7 to 9 p.m. with a wake service to be held at 7 p.m. Her funeral mass will be celebrated on Friday afternoon at 4 o’clock in the Chapel of D’Youville Senior Care Center, 981 Varnum Ave, Lowell. Committal prayers and burial will take place on Saturday morning at 10 am in St. Joseph Cemetery, Chelmsford. In lieu of flowers, the Sisters suggest either a Mass offering or a memorial donation in her name to D’Youville Senior Care, 981 Varnum Ave., Lowell, MA 01854. Arrangements by the R. W. MARTIN FUNERAL HOME 308 Pawtucket Street, Lowell. For online condolences or directions, please visit www.martinfuneralhome.net.